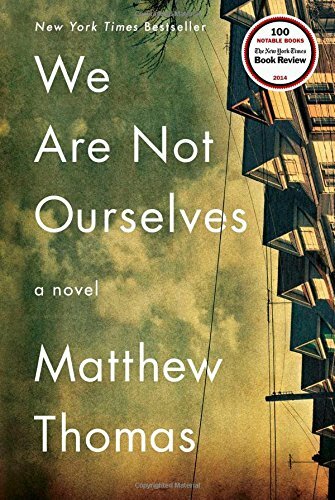 Let me preface this review, by saying that Matthew Thomas’ We Are Not Ourselves is not escapist fiction; this is gritty, unsparing realistic fiction that is done magnificently well. It has taken me approximately three months to read this novel, more from the difficulty of some of the later subject matter (not going to divulge any details about it, as that will spoil the book),versus the more common reason of it just being interminable or slow-paced (which this book wasn’t, by any means). From the beginning, I was absorbed almost immediately into the main female perspective’s narrative about her Irish-American family, which was never detailed in any way that was schmaltzy or cloying. Also being a story that focuses primarily on a small window into a more provincial lifestyle of one family through many generations, the story of Eileen Tumulty is a sketch of someone that ostensibly feels like a traditional child, born among the baby boomer generation, as she inherits the far-flung idealism of her ancestors, and also the general sanguine feelings that most of the people of the generation she was being born into were feeling at this time. You get a lot of small, very entertaining anecdotes about her father, and how he was a complex, almost iconoclastic figure (to those around him) in the foreground of Eileen’s upbringing. But even with this small shred of pride about her father, there was always a deflated, or disillusionment with the world around her, which Matthew Thomas, deeply describes in the beginning scenes of this multifaceted story about one family, and the various disparate perspectives that really make a family the perfect microcosm of human society as a whole. In one sense, at least from my first impressions of this part of the story, it felt like a general family portrait type story, with all the small,incremental vignettes that provide us entertaining, colorful snapshots of certain given moments in their life. Many of the beginning parts have more levity, except there is always a more underlying, almost nihilistic shadow that haunts the subconscious of all the characters in this story, in one way or another. Chronologically, the novel reads in a very linear sense, as a deceptively straightforward story of one family, confronting the vicissitudes of fortune, in their own idiosyncratic way. Except, it is the deeper story that is really the most riveting aspect of this novel-the psychological layer- that emerges through the cracks of the story with Eileen’s story, but deepens through her marriage with Ed, a very quirky, shy, affable, but very altruistic husband. The novel is comprised of elements of existentialism, issues of developmental psychology, science, spirituality, among a slew of other pivotal questions, all dealt with in a very artful, sensitive manner. Matthew Thomas’ mastery of writing lies in really providing nuance and depth to the shadows that lurk behind the visage of the pleasant, idyllic family portrait. I am almost reminded of the infamous line from Leo Tolstoy’s Anna Karenina-“”All happy families resemble one another, each unhappy family is unhappy in its own way.”- at many points during the story, where we are given such intimate examinations of the interior story that unfolds in the minds of each member of Eileen’s family that she strives to form with Ed. Eileen wishes fervently to mold a facsimile of the illusory white-picket fence American Dream, but the obstinacy of Ed’s more scientific realism always seems to prevent this dream from being enacted, at least in the earlier stages of the novel. Their divergent approaches to how they’ll shape their family lives provides readers with a very interesting power struggle, which has some very ironic, tragic results later on. It was this very tragic circumstance that is described with such unsparing realism that forced me to put the book down for two months because I just wasn’t in the right state of mind to endeavor to read the rest then. Now as Christmastime approaches, I was finally able to pick it back up, while having to put it down whenever the influx of heavy-weighted emotions becoming too hard to handle. Fortunately, Matthew Thomas is very sensitive, when dealing with this specific tragic circumstance, as there are moments of needed catharsis and levity, in just the right, appropriate dosages, as to keep the reader from feeling far too overwhelmed to read the remainder of the book. And it is a difficult topic, but the writing in the last three-hundred pages is stunning. I have never been as deeply moved by a book in awhile, and it really is the best examination of the mysterious dichotomy of life-and-death, since Emma Thompson’s Wit (which is a HBO produced film, not a book written by Emma Thompson). Both Wit and We are not Ourselves are cerebral, sometimes very intense, but they both deal with an issue that will leave an indelible impression of the enigmatic richness of life itself. Ending 2014 with this book, which took around three months to read, was worth the effort, because it may just be my favorite book of the whole of 2014 (and I’ve read a record amount of books this year). If anything could make me go through a tumult of different, sometimes hard-to-recognize emotions, it is this book, that had the power and ability to really leave a very deep impression on not just my heart,but also my soul. And yes, that sounds prosaic and maybe, even trite, but I felt like it was the most apt description of just how much We are not Ourselves, a very literary novel at its essence, effected me. You should really consider reading this book, if you are looking for something poignant, and even realistic, that deals with the largest questions of our lives, and the traumas and surprising moments of joy; you should really consider adding We are not Ourselves to your book list, or as a candidate for the next book to be discussed at your book discussion group’s monthly meetings.